Keep your dog protected with one long-lasting tasty chew. We know how much dogs love treats, so we made one that gives your furry friend long-lasting protection from fleas and ticks. One simple, tasty chew just four times per year will keep your dog protected against fleas and deadly paralysis ticks through every season. A single Bravecto chew also provides 8 weeks protection against brown dog ticks, and effectively treats infections caused by mites*. Bravecto Chew for Dogs works rapidly from the time of consumption to effectively control fleas within 8 hours and paralysis ticks within 24 hours, so your dog can be free to explore and enjoy life. Our tasty chew makes parasite protection easy, delicious and simple. In studies, over 9 out of 10 dogs happily chomped their way to a long-lasting defence against fleas and paralysis ticks. Give your dog a chew around feeding time and get back to enjoying life together, without interruptions. Bravecto is proud to deliver a safe, well-tested solution for dogs and cats worldwide against ticks and fleas. Our products have undergone rigorous regulatory approval processes and are sold with confidence in over 70 countries and are determined to be safe when used according to the label. 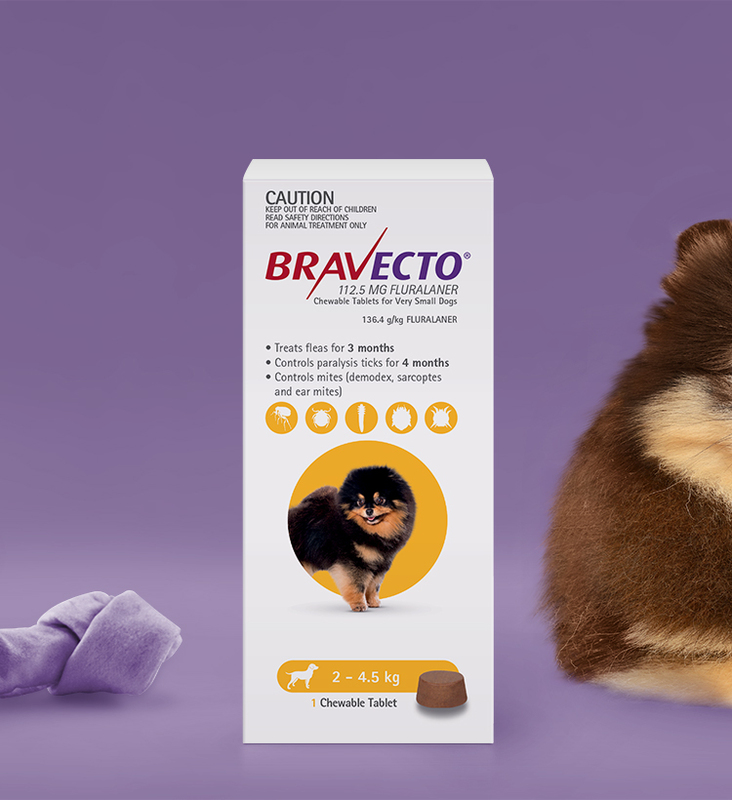 With comprehensive clinical research, Bravecto has been proven safe for use in breeding, pregnant and lactating dogs as well as puppies over 8 weeks of age weighing at least 2 kg. Global safety monitoring of Bravecto use continues to provide additional compelling evidence of the safety of the product. Giving Bravecto Chew for Dogs is easy. Simply give your dog our tasty chew at, or around, mealtimes and let them chomp their way to long-lasting flea and paralysis tick protection. Where can I buy Bravecto? 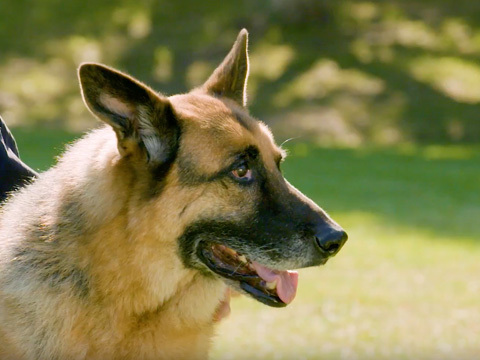 Bravecto is available from veterinarians and leading pet shops. What will Bravecto protect my pet against? *Refer to product label for full claim details. What should Bravecto chewable tablet look like when they come out of the package? Bravecto is a light to dark brown tablet with a smooth or slightly rough surface and circular shape. Some marbling, speckles or both may be visible. 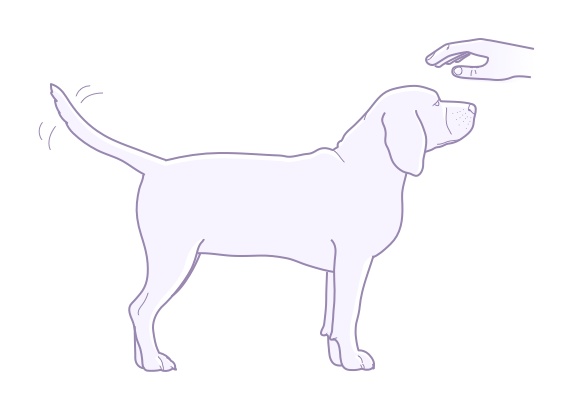 When is it safe to pet my dog after administering Bravecto? There is no reason to stop touching your dog when treating with Bravecto. Can I use Bravecto all year-round? Yes, it is safe to use Bravecto all year-round. Fleas can be a year-round problem indoors and outdoors. 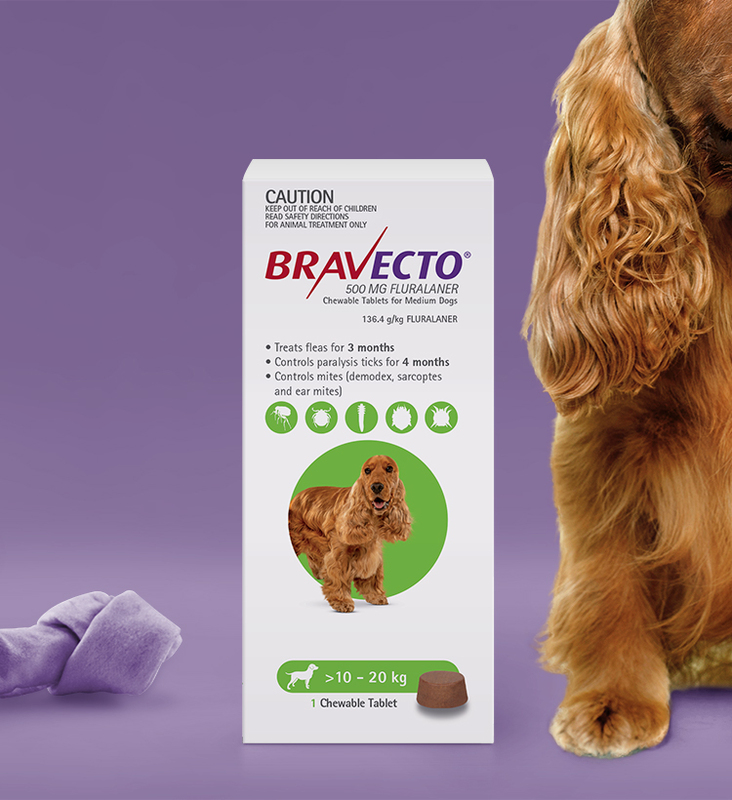 Administering Bravecto Chew for Dogs every 3 months ensures your dog will be protected from fleas throughout the year. My dog is taking some medications for another condition as well right now. Is it safe to give Bravecto? It is always best to discuss all of your dog's treatments with your veterinarian as they are your pet's health care expert. What weight ranges does Bravecto Chew for Dogs treat? 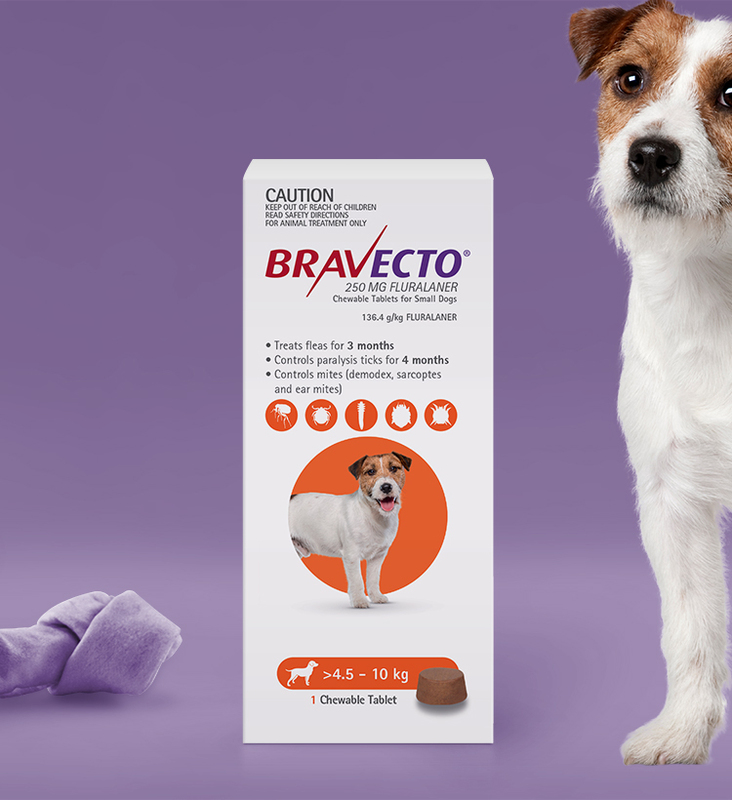 Bravecto is available in single dose packs for dogs ranging from 2–56 kg. One dose of Bravecto Chew for Dogs provides 3 months protection against fleas and 4 months protection against paralysis ticks. How does Bravecto Chew for Dogs kill fleas and ticks? 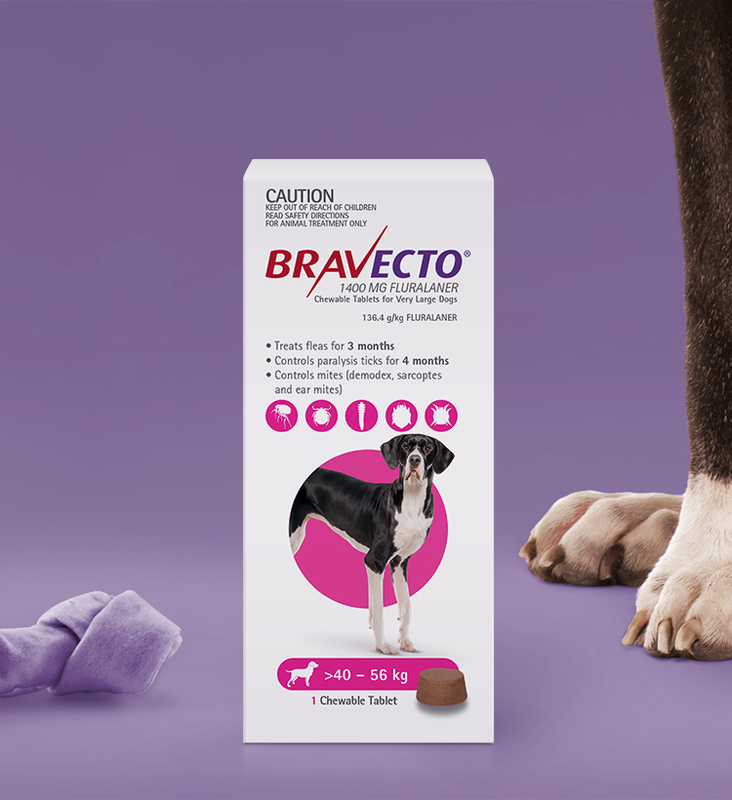 After you give your dog Bravecto, the active ingredient quickly reaches tissue fluids just under your dog's skin. When fleas and ticks feed, they take in Bravecto and die. 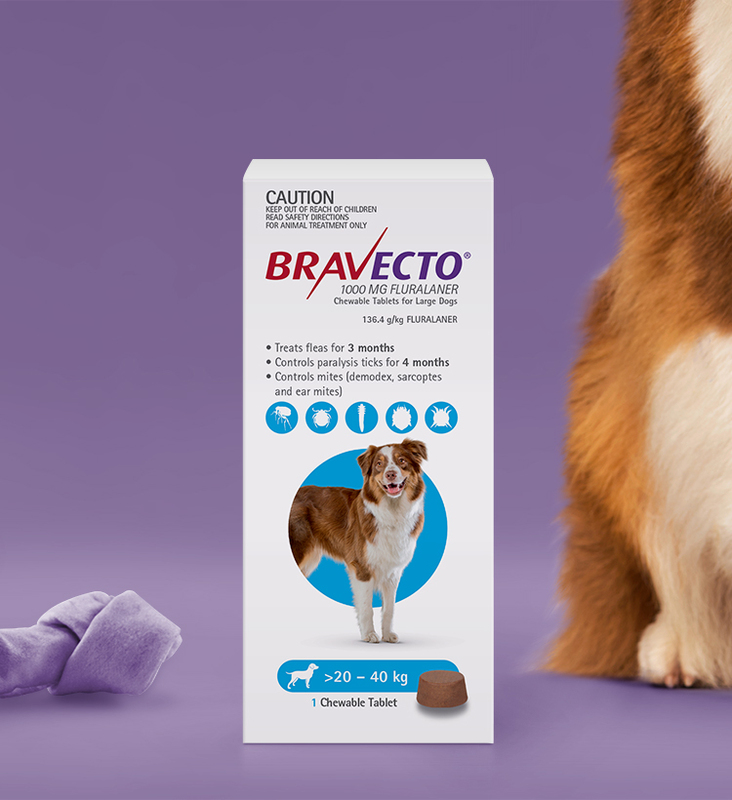 Bravecto Chew for Dogs starts to kill fleas after 2 hours and provides effective control within 8 hours for fleas and within 24 hours of attachment for ticks. Bravecto Chew for Dogs controls flea infestations for 3 months and paralysis ticks for 4 months. Can I give the Bravecto Chew for Dogs to my cat? No. Bravecto chew is not approved for use in cats. However, we recommend Bravecto Spot-on for Cats, which lasts up to 3 months and provides effective protection against fleas and paralysis ticks. It also reduces the incidence of flea allergy dermatitis (FAD). How tasty is Bravecto Chew for Dogs? In a study^ which included 144 healthy dogs, 91.7% of dogs ate the chew voluntarily. Is Bravecto Chew for Dogs waterproof? Can my dog swim after I give him Bravecto Chew For Dogs? Can I shampoo my dog? Do I need to bathe my dog before treatment? Does Bravecto Chew for Dogs work differently on long and short haired pets? 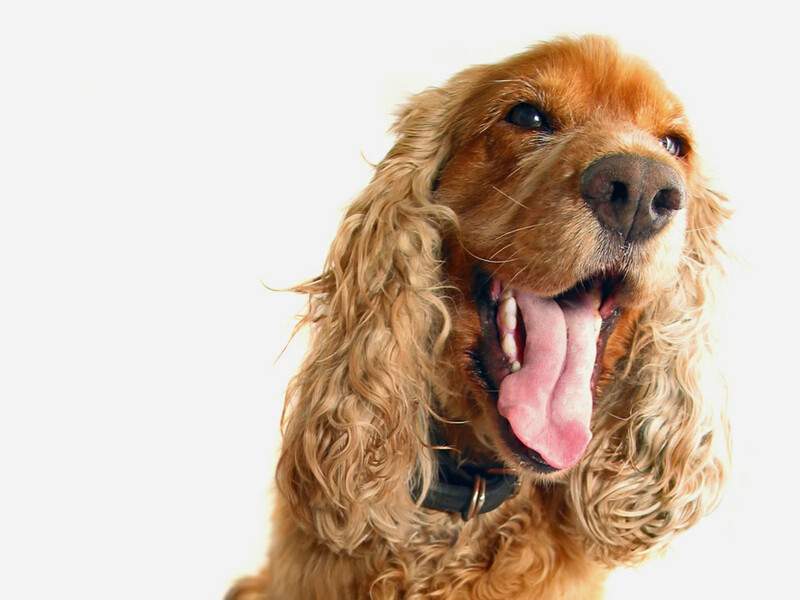 Can I brush my dog after administering Bravecto Chew for Dogs? Bathing, shampooing or swimming should not affect how well Bravecto Chew for Dogs works. Coat length and grooming or brushing also have no impact on how well it works. What time of day should I give my dog Bravecto Chew For Dogs? Bravecto Chew for Dogs can be given to your dog any time of the day; however it is recommended that you administer the chew at or around time of feeding. Will Bravecto kill ticks and fleas that are already on my dog? Does Bravecto kill fleas before they can lay eggs? Yes. Bravecto kills newly emerged fleas before they lay eggs and breaks the flea life cycle. Can dead and attached ticks be found on treated dogs? Yes. Due to the way Bravecto works, dead attached ticks can be still seen on animals following treatment. Dead ticks can be easily removed as opposed to live ticks which take some force to dislodge from the skin of the animals. Is it necessary to use additional insecticides to control flea stages in the environment? No. Bravecto Chew for Dogs kills fleas and prevents flea infestations for 3 months, a time period that covers the entire flea life cycle. Bravecto also kills newly emerged fleas before they can lay eggs. Therefore it is not necessary to use additional insecticides to control flea stages in the environment. Can Bravecto be used in breeding/pregnant/lactating dogs? Yes. Bravecto is approved for use in breeding, pregnant and lactating dogs. When should dogs start treatment with Bravecto? Bravecto can be administered as early as 8 weeks of age. Dogs should weigh at least 2 kg. Do I really need to treat for fleas all year round? There are very few places in the world where there are no fleas. In warmer climates, fleas are present all year round while in more mild climates fleas are present mainly from late spring through to late autumn, and even longer thanks to central heating. To be on the safe side Bravecto Chew for Dogs should be administered every 3 months all year round to avoid giving flea populations a chance to build up in your home. Is there any difference in efficacy if a dog chews the tablet, or swallows without chewing? No, there is no difference in efficacy between dogs that swallow a Bravecto chew compared to those that chew the tablet before swallowing. Why does my dog scratch even more on the first day of Bravecto treatment? When fleas are in the process of dying their movements become uncoordinated. This may cause a skin sensation which can result in increased scratching by the dog. However, this phenomenon is quickly resolved once the fleas are dead (Bravecto Chew for Dogs provides effective control within 8 hours for fleas). Why do I see more fleas after I have administered Bravecto? Fleas can continually re-infest treated dogs – either from juvenile flea life stages that have just matured to adults in the household or from fleas that jump onto the dog when outside or visiting other homes. Bravecto will quickly kill these fleas. Also, as fleas die, they can move from the skin surface where they feed, to the tips of the hairs in the coat, making them more visible to the human eye. Why can I still see fleas after I have treated my dog with Bravecto? The fleas you see on your pet are fleas which have newly emerged from their cocoons in the home or outdoor environment and jumped on your dog. These fleas will die quickly. This is because only a small percentage of the flea population is on your dog. Most of the flea population exists as immature stages (eggs, larvae and pupae) in your dog’s surroundings. It takes some time to clean out a flea population in the house. To help speed this process up, you should clean your house thoroughly (for example, by washing your dog’s bedding and vacuuming their favorite spots in the house) to help reduce the number of immature fleas in carpets, cracks and crevices. In case of a serious infestation, it may take some time to control the infestation. But any fleas you see on your dog a few days to weeks after treatment probably represent re-infestation from fleas emerging from cocoons in the environment. Bravecto Chew for Dogs’ flea protection lasts for 3 months - during this period, there is no need to re-treat your dog. Where can I get more information about Bravecto’s claims? All product labels for Bravecto can be found on the APVMA (Australian Pesticides and Veterinary Medicines Authority) Pubcris database. Where can I get Bravecto? 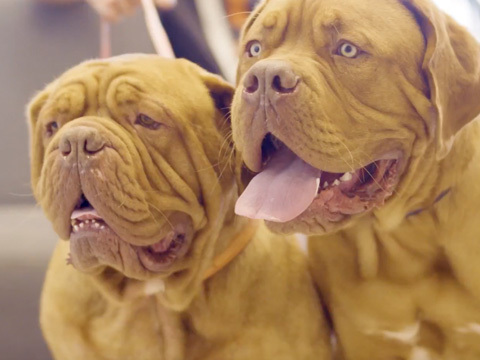 You’ll find Bravecto at leading veterinarians and pet shops where pet health experts can advise on the best and most appropriate treatments for your dog or cat. Find your local stockist by entering your suburb below. Copyright © 2018 Intervet International B.V. All rights reserved. BRAVECTO ® is a Registered Trademark of Intervet International B.V., The Netherlands. Content intended for Australian audiences only.